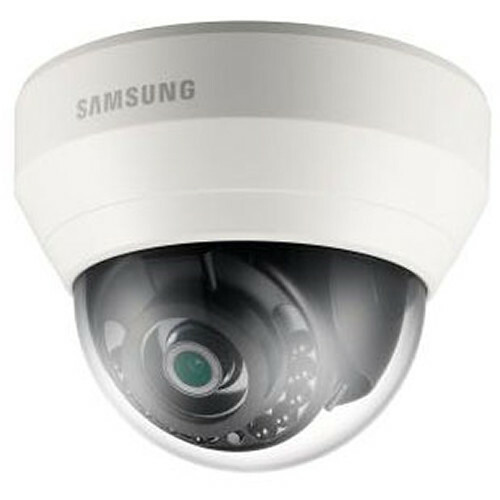 The WiseNet Lite SND-L6013R 2MP Network Dome Camera with Night Vision from Samsung captures 1080p video at up to 30 fps thanks to its 1/2.9" progressive scan CMOS sensor. It's 3.6mm fixed lens has a wide 101.2° diagonal field of view to capture large areas, depending on placement. A mechanical IR cut filter and IR LEDs allow this camera to produce clear images in complete darkness from up to 49' away. Video is compressed using H.264 and MJPEG codecs to ensure high-quality recording and playback. The camera uses PoE technology to simplify installation and is designed for indoor use. Box Dimensions (LxWxH) 9.25 x 6.35 x 5.75"
WiseNet Lite SND-L6013R 2MP Network Dome Camera with Night Vision is rated 4.5 out of 5 by 2. Does list time date as recording ? This camera does have a System-on-chip which will allow you to have the date and time stamped. However, when paired with an NVR, the NVR can be set up so the date and time is stamped on the video. What version of ONVIF compliance does this camera have? Not profile, but version number. Is this camera for outdoors? This camera is not rated for outdoor use. What voltage do these cameras require? I think the technical answer would be 48 volts DC. The non technical answer would be to inform you that you need to connect the cameras to a video system that offers ports with 48 volt DC output or get a PoE power injector that can be plugged into a standard 120 volt AC outlet and both power the camera and let the audio and video signals pass through. We will have some wired directly to the NVR that get power from the NVR. Other cameras far away from the NVR use the building internet wires to transmit signals to the NVR but those cameras must be powered by their own PoE injectors.